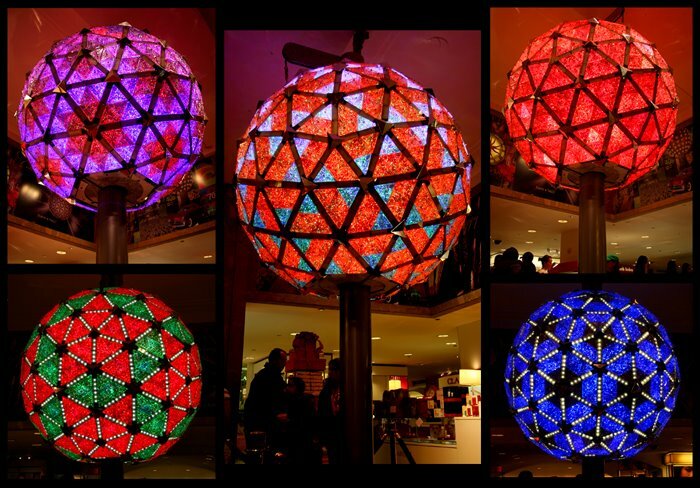 On New Year's Eve in 2007, I wrote of the ball drop in Times Square - see here. At the time I was disappointed to learn that prior to the drop, the ball was displayed at Macy's, and I did not get a chance to see it closeup. On a recent visit, I was pleasantly surprised to see that the ball was already installed on the main floor - and that I now I had completely forgotten about this recent tradition. It feels like Christmas promotions and retail store decorations come earlier every year as the push to maximize holiday business accelerates. At one time, Black Friday (see posting here) was the demarcation point for the start of the Christmas countdown - even at that time it seemed rather early to begin preparations over one month in advance. But any retailer has little choice in order to keep up with the competition. It is difficult to swim against the tide - barring some supreme effort, most will be swept by the current. This very posting is driven by the same pre-holiday frenzy - the ball is on display early. To write about it later, would look like I missed the boat. Even though I do not see this blog as competing per se with conventional journalism, I still feel an obligation to "do" certain stories in a timely manner. Additionally, everything moves so much more quickly - in the electronic world, almost immediately. We no longer have the luxury of doing things at our pace - the speed of everything around us often dictates when we must do things. Of course there are many ways and situations where one can buck the trend - to appreciate things on one's own terms is a laudable goal and can provide respite from the pressures of living in a technological world.